The Plug & Play 10 metre long low voltage cable extension can be used to extend the distance between the weatherproof lighting transformer and the pond or garden spotlights. Other items can also be connected from Water Garden's range of Pond & Garden Lights and Outdoor Cables & Accessories. 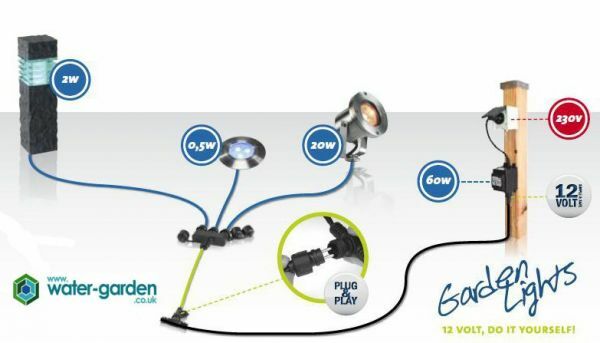 The 10m extension cables can be used with up to 150 watts of outdoor lighting maximum on the low voltage circuit. The 10m extension cable features a screw threaded connector at either end, eliminating the need for tools to install the 12 Volt lights and accessories. View the Video on the tab below for more details on how to connect this versatile range of outdoor lighting.